Building block clubs are all the rage in libraries. But why should the big kids have all the fun? What about the youngest patrons? Last month, thanks to Mega Bloks, some area tots in our community had a chance to play with blocks at the library just like the older kids! Mega Bloks recently invited me to host a Mega Bloks party and sent me a huge party kit. What better place than a library to have a building block party? Our library offers a parent/child lapsit storytime for the little kids. Each week, kids and parents sit together on the floor, sing songs, have fun with fingerplays and read a board book. Afterwards, there's an unstructured playtime for the kids and chat time for the parents. Both my kids are graduates of the program, my son just recently. The Mega Bloks party gave me a reason to go back for one last tot storytime and gave the other parents and kids a chance to try out some Mega Bloks toys for tots - specifically the MEGA Maxi Blocks. After the storytime party, I donated the Mega Bloks farm that came with the party kit to the library for use at their playtimes. Additionally, ten kids at storytime got to take home their very own Garden Friends or Jungle Friends block set. It was like Christmas a month early! MEGA Maxi Bloks are appropriate for kids ages 1 and up. 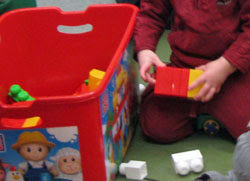 The blocks are large sized (even bigger than the DUPLO size), making them easy for little hands to manipulate and stack. What I really like about the Maxi Bloks is that while they are perfect for the very young, unlike many baby toys, kids never really grow out of MEGA Bloks. 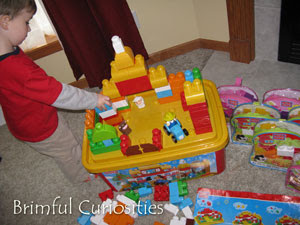 All ages of kids enjoy building with these blocks and using their imagination to construct colorful creations. Plus, the large size of the blocks allows kids to quickly build a nice sized structure, giving them a sense of accomplishment. Mega Bloks sent us a Mega Bloks Maxi Farm to play with at the party. The 95 piece Maxi Farm set comes in a large tub and includes a tractor, farmer, farm animals and a swinging gate. The container lid doubles as a building foundation (though the flexibility of the lid makes it a rather unstable surface). The set also includes a sticker sheet kids can use to decorate and customize their blocks to go along with the farm theme. The set works with other Maxi Mega Bloks sets. My kids played with it at home before we took it to the party and they really didn't want me to donate the set to the library (good lesson for them on charitable giving). My son really likes the tractor the best of all and prefers building structures for the tractor - it's nice that Mega Bloks included a vehicle with the set to add to the imaginative farm play value. The farm retails for $44.99. Many families own block sets for home play, but the versatility and durability of the Mega Bloks sets also makes them an especially good choice for childcare centers, schools and libraries. The plastic blocks are easy to keep clean and sanitized so it doesn't matter if they accidentally end up in the mouth! Plus the nice sized blocks don't pose a choking hazard and are not easily lost. Thanks to Mega Bloks for giving me the chance to host a party and donate the farm set to our library. I know the set will receive years of use and hopefully all the families will enjoy their new block sets! 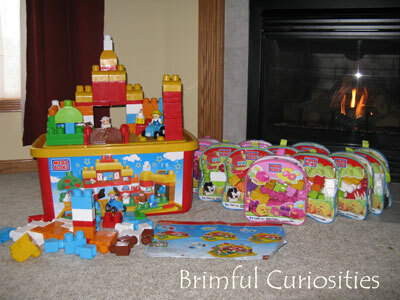 Many thanks to BSM MommyParties and Mega Bloks for providing the Mega Bloks Maxi Party set. Also thanks for providing ten Mega Bloks sets for the storytime families to take home. Learn about the latest Mega Bloks developments at the following sites: Twitter or Facebook. Join the Mega Bloks Family Club to receive coupons, learn about new products and lots more!